There may be some truth to the idea that the best weddings — not the most important, to be clear — are almost always other people's. It's a whole lot easier to enjoy the festivities when you're not the one who paid for them, after all. 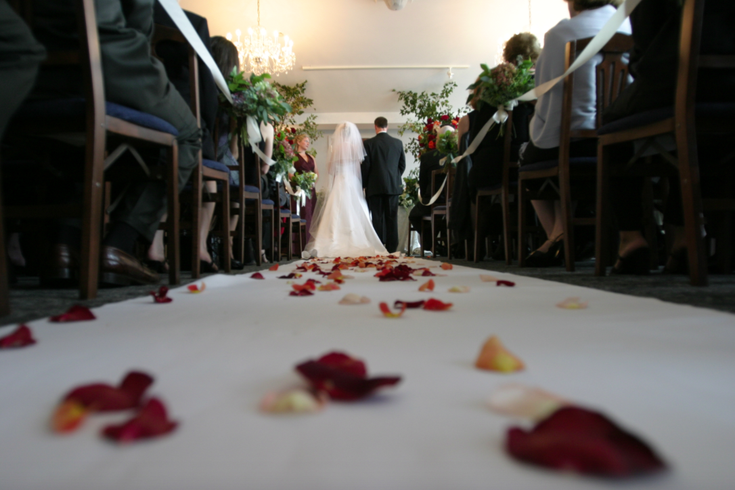 A new study from The Knot puts the eye-popping reality of American weddings in perspective, breaking down the average cost of various budget items and revealing the most expensive places to get hitched in the United States. The average cost of a wedding in the United States in 2017, minus the honeymoon, came in at $33,391, according to the analysis. On average, there were 136 guests per wedding and an average engagement period lasting 14 months. For those who got married in Manhattan, weddings were more than twice as expensive as the national average—$76,944. South Jersey wasn't far behind, coming in at No. 15 with an average wedding cost of $40,231. The highest spender in 2017, according to the study, shelled out $105,130 on their wedding. This was probably a drop in the bucket for them, one can only assume. If you're looking for a cheap place to get married, couples spend the least in New Mexico ($17,584), Utah ($18,516) and Oregon ($20,652). Here's a breakdown of the national average wedding budget.